He is a sculptor, artist, instrument maker, restorer, player, who knows what else. Martin says that this was a prototype (working the bugs out) and the next one will be for sale. 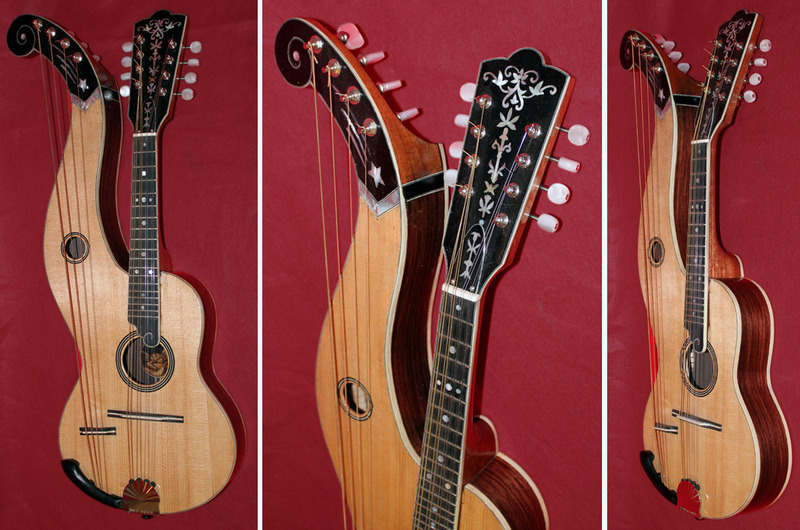 Note that it is a “true” harp mandolin, with 4 extra bass strings, a la Knutsen. Other than Nate Blaustein’s Tonedevil at the last Gathering, I haven’t seen any other new instruments lately. A very “bulbous” LTP (Lower Treble Point) specimen, owned by Leta Bell, probably purchased new by her grandparents. What do you think – koa? Or something else? 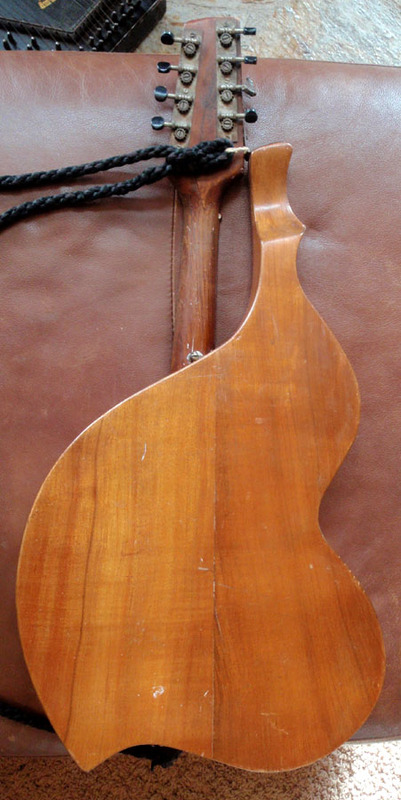 Here’s a nice LTP that luthier Paul Hostetter of Santa Cruz found in Port Townsend (not where we think it was built, but curious…) around 1977. I’ve been after photos since the Knutsen Archives went live! (Better late than never – thanks, Paul!). …or close. 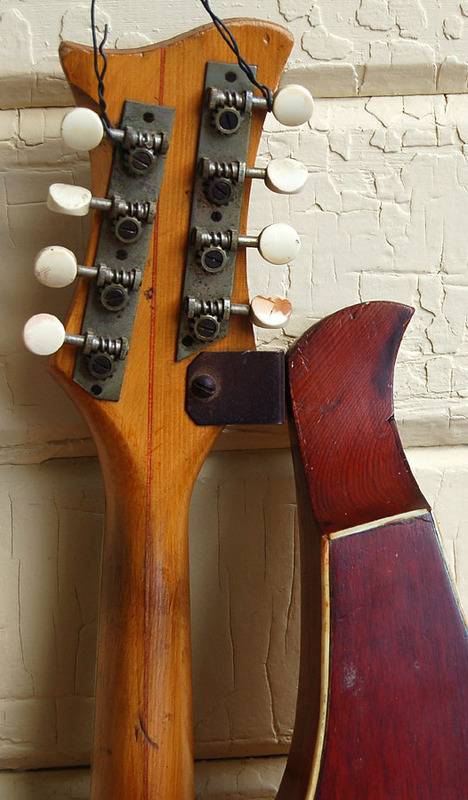 Look how much meat he had to carve out of his completed headstock so you could turn the knob! Here’s a new LBP (Lower Bass Point) specimen. This shape we believe to be earlier than the LTP, and not as common. Owned by Eric Lettau. That’s what I thought I was getting last week, when a fellow sold me his family’s Knutsen (unfortunately, no provenance). This was the first LBP specimen I’ve seen “in the flesh” and I was surprised how tiny it was. Here it is hanging next to my LTP which is 11-1/4″ wide. The LBP is just 9-1/4″ – overall, more Dyer-sized. It’ll need work to make playable. I doubt it’ll sound as good as the other, which is one of the best sounding mandolins in the collection – loud, resonant and bouncy. Hey, did I ever show you this? I see it’s not on the site yet. 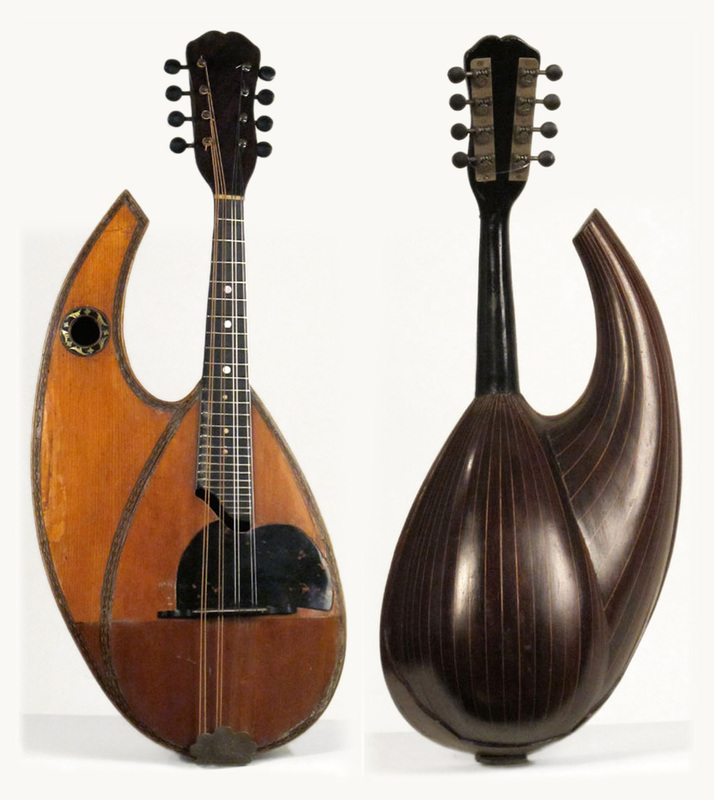 I longed for an example of the rare bowl-back hollow-arm harp mandolin – this was the first and only I’ve seen for sale. This was a bit of a mess – Kerry Char made it presentable, but we couldn’t make it playable (well, not on my budget). He thought it might be Italian; I think it’s probably American. Either way the ribbed gourd-shaped scenario stuck into the other ribbed bowl creates the craziest seams! Aw, that little Knutsen is cute! Maybe for a child? The harp-bowlback looks like one of my intersection-of-volumes drafting problems..
Nice finds Gregg! Martin is in my neck of the woods, and I have been trying to hook up with him to see and hear his harp mando. Soon hopefully. The bowl back is just too cool. Don’t think I’ll be trying to build one of those!